I don't mind telling you that I personally voted for Hillary Clinton, because I'm pretty attached to my basic human rights, and I'd like to keep them around for at least another four years. When such important issues are on the line, it makes me feel good to see famous people coming to the same conclusions that I am, even if it's for different reasons. Like, there are a lot of celebrities voting for Hillary Clinton in honor of their daughters, believe it or not. Obviously, there are plenty of reasons to go with Clinton even if you're a full-grown adult with no small humans looking to you for answers. However, there's something particular about being the parent of a little girl, and wanting to make sure she grows up in a world where she has the same rights as a little boy. Since there are such disparities between the worlds envisioned by the two candidates running, many celebrities with young daughters have chosen to underline precisely why they're #WithHer. It's heartwarming to note that these 12 Hollywood parents are not only responsible citizens, but excellent parents as well. They're looking out for the future of their daughters, wanting to drive home the point that no obstacle could possibly stand in between their child and greatness. That deserves a standing ovation as far as I'm concerned. Well, that worked out nicely, didn't it? One person not qualified, the other person extremely qualified? Thanks for pointing that out for us and Baby Luna, John Legend. Can you imagine growing up in a world where your first two presidents were Barack Obama and Hillary Clinton? I'm jealous of Barrymore's daughters Olive and Frankie. "I want my daughter to grow up seeing a woman lead our country and know that her possibilities are limitless." I'm not crying, you're crying, Blue Ivy. Imagine being McCarthy's daughters, and your mom is not only hilarious, but also woke AF. Good for you, Georgette and Vivian Falcone — your futures are bright. Suri Cruise was really in the spotlight for a minute there. I love that, now, Katie Holmes is protecting her daughter from the glare of the media, and casting her vote for a leader who can inspire, not exclude. I can't even talk about this photo of Oswalt and his daughter Alice without crying, so let's just absorb this amazingness and move on. Speaking of crying, it's so beautiful seeing Olivia Wilde shed a tear over getting to cast a vote for our first female President in this historic election — her daughter Daisy's first. As she says herself, this isn't a typical post for Gellar, but this is a hugely important day for her kids, particularly daughter Charlotte Grace. The reality star keeps it short and sweet, posting a photo of her own daughter, Penelope Disick, and Kim Kardashian's daughter North West to remind us that this moment is so much bigger than just ourselves. We may not know the name of Blake Lively's second daughter with Ryan Reynolds yet, but we know the star is a Hillary Clinton supporter, because she feels it's what's best for the next generation. The Scandal star is notoriously private about her personal life, but this powerful woman endorsed Clinton in a video with Shonda Rhimes, is currently on maternity leave with her second pregnancy, and has a young daughter, Isabelle, at home. Believe me, she knows a thing or two about the needs and capabilities of women and how to provide those for the future. 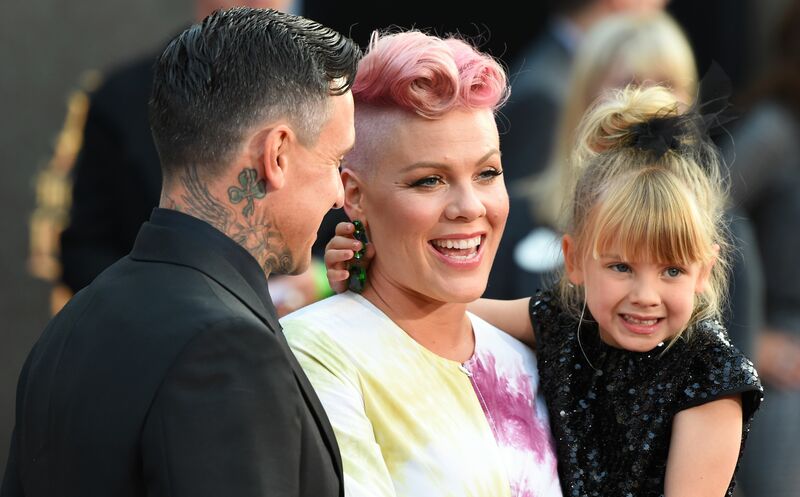 Can someone go over to Willow Sage Hart's house and tell her how blessed she is to have Pink as a mom, looking out for her like this? I'm tearing up just reading this Instagram caption. Election Day is a day with so much overwhelming emotion, when it can feel hard just to be an adult. iI's nice to see that the current generation and the future generation of Hollywood are in good hands.